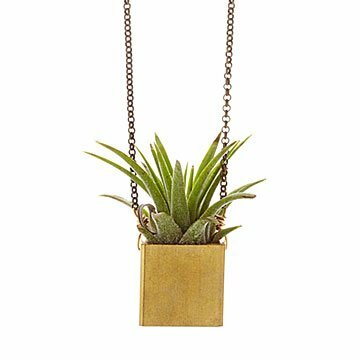 This necklace has a brass cube pendant that holds a tiny, living air plant. Bring new life to your look with this unique necklace from designer Larissa Loden. The pendant is a brass cube containing a tiny, one-of-a-kind air plant, and because it's alive, it can also start to feel like a cute little travel companion wherever you go. Air plants don't require soil and are easy to maintain, so you and your little green friend have many adventures ahead of you. Handmade in Minnesota. WATERING: Remove from necklace, then... soak in water for 20-30 minutes, let completely dry and then reinsert air plant. Do this once every 2 weeks. When not wearing - indirect light or bright indoor light. Brass components will naturally patina, especially in humid environments. Keep in cool, dry place and use polishing pads to brighten, if desired. Our Mother lives to garden and wears eccentric jewelry. We thought this would be perfect for her. She absolutely loves it! She receives compliments every time she wears it. The holder of the plant should have come with a mesh to hold the plant in place. I made my own with a bit of plastic that my avocados came in. The plant itself was dry and crispy so I replaced it before I gave it to my daughter. This is a great necklace. It is pretty and easy to care for. Ours didn't come with leaves pointing upward like the picture. Ours was curled down over the sides, hopefully the plant is healthy. The only fault with it, is the plant does seem to fall out easily. I wear it often and always receive comments I have been satisfied with everything purchased from Uncommon Goods...my favorite catalog!